Wewa is the last enrolled member of the Northern Paiute tribe who is fluent in the Numic language spoken by Paiutes, and the last man on earth who can sing the burial songs of his people. Sit with that thought for a minute. Imagine that you are the last person on earth who is able to speak English fluently, or to sing "Amazing Grace" while burying a loved one. That's heavy stuff, and maybe even impossible to fully appreciate, given that almost none of us have ever carried the responsibility to forestall an extinction-level event. 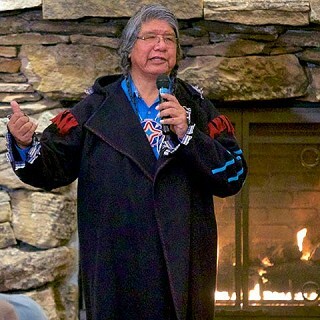 Wilson was in town from his home at Warm Springs to give a talk last Tuesday night, an event hosted by the Sisters Historical Society at the FivePine Conference Center. The turnout was terrific, and perhaps most gratifying was that copies of his book, "Legends of the Northern Paiute," sold out in minutes. The book is a profound gift to the literature and history of the West, and collects for the first time in one place many of the Paiute origin stories, from Ft. Rock and Newberry Crater to Nuwuzoho the Cannibal - known to us as Monkey Face. For my money, the Paiute story is far more interesting. The legends Wewa relates in his book are an important part not just of native cultural heritage, where they were born and passed on for generations during storytelling time in winter, but the heritage of anyone who is living in the modern West. What underwrites the sincerity of the legends is a way of seeing and understanding, a way of living in the desert that proved sustainable for over 400 human generations, which isn't something the desert's newest tenants - that's us - seem to have figured out just yet. And one hopes that it won't take an extinction-level event in our own culture to finally hear the truth available in the legends. Paiute peoples have been living in and around this portion of the country for over 14,000 years. We know this in large part because of archaeological discoveries made at the Paisley Caves at 5 Mile Point - mass spectroscopy dated copralites there to 14,300 years ago - the excavation of sandals from Ft. Rock and the Lovelock Cave in Nevada, and various other sites scattered throughout the Great Basin containing datable evidence of human habitation. Wilson believes his people have been around for even longer, and he's probably right. Proving it is another story, but there is every reason to believe, given that mastodon tusks have been recovered from the Black Rock desert, bison kill-sites have been found at Malheur Lake, and an 11,000-year-old woven fiber bag was excavated at Spirit Cave in western Nevada. When sitting down with Wilson Wewa, the great-great-grandson of Chief Paulina, the weight of that history becomes palpable. And one of the tremendous benefits of talking with him is that it engages us intimately in a different version of the Western myth - a story told from the inside out, and one that has been exceedingly, and often deliberately, cruel to indigenous people across North America. That's a legacy that is far overdue for acknowledgement, and correction. But Wilson Wewa doesn't have time for anger. He is certainly aware, far better than most, of what has been done to his people, but his focus, with the time he has, is to preserve and pass on the knowledge entrusted to him. From a young age, Wilson traveled the country with his grandparents, chasing the seasons from Warm Springs to Shaniko, from Prineville to Burns, and ultimately into the Paulinas digging camas roots, collecting and dehydrating berries, and hunting deer, antelope, and elk. That experience has made him a recognized expert in the ethno-botany of the Great Basin, and a frequent lecturer at universities across the country. Three times a year he travels to Washington, D.C., meeting with officials in the ongoing effort to improve conditions for his people. As we enjoyed a fine breakfast, and talked about things of the desert, it occurred to me how refreshing it would be to have leaders in our own culture who carried themselves with the gravitas, integrity, and selflessness that Wilson does, and that is represented at least in part by the traditional braids that hang down over his chest. In Paiute culture it is a tradition to cut one's hair as a display of mourning when a loved one passes on. When Wilson's father was dying of cancer, he called Wilson in and asked him not to cut his hair. "He used to travel with me when I would talk to people," Wilson said. "He saw the power of the language when I spoke to them, and how people would pay closer attention to me. My braids are part of that. 'Don't cut your hair,' he told me." Wilson Wewa never cut his hair. And he works now, every day, to preserve the links of his people to 14,000 years of history - now funneled into the heart and mind of a single man - to the country we all call home.